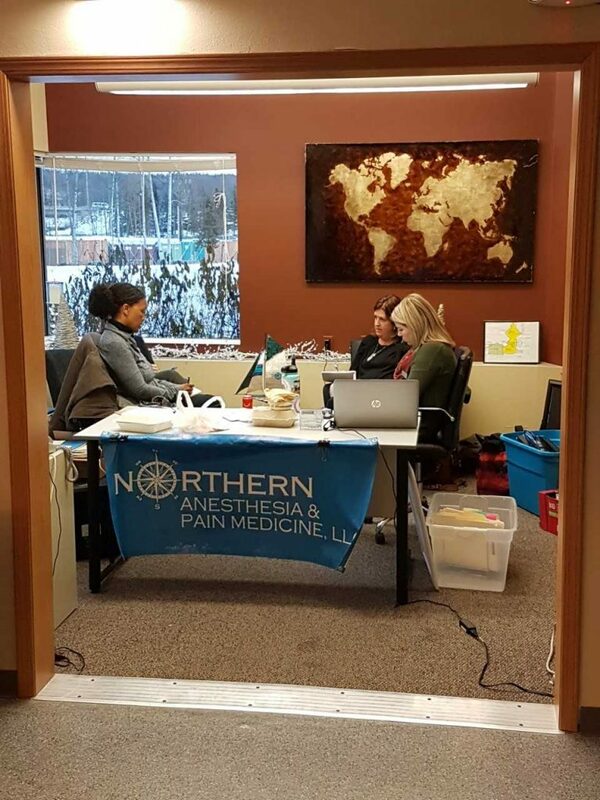 ANCHORAGE, AK (December 7, 2018) – A week after a 7.0 magnitude earthquake violently shook this area, numerous strong aftershocks continue to have many residents on edge, but Covenant churches also are assisting their neighborhoods. In one hour on Thursday afternoon, four strong aftershocks were recorded, including one that was above 5.0, Millikin said. 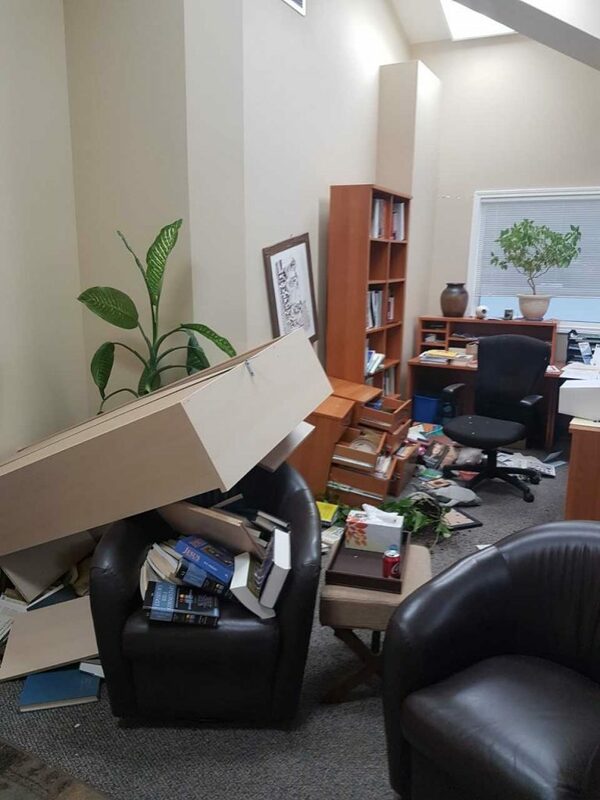 The first earthquake knocked over shelves in the office of Todd Michero, pastor of Community Covenant Church in Eagle River. Authorities have said there have been roughly 3,000 aftershocks, although most have been small or deep enough not to be felt. They do continue to cause the cracks in drywall as well as the gashes in the roads to wide. Most of the homes in Wasilla received relatively minor damage. The church wall was built to flex a bit, so they remained strong even though interior work of the roof needs to be repaired and ceiling tiles replaced. However, the quake “totally thrashed” many of the homes and structures in Eagle River, located just several miles from the epicenter, said Todd Michero, pastor of Community Covenant Church. Many of church’s members suffered heavy damage to their homes. Major damage was done to some roads, and the elementary school will be closed until the end of the academic year. 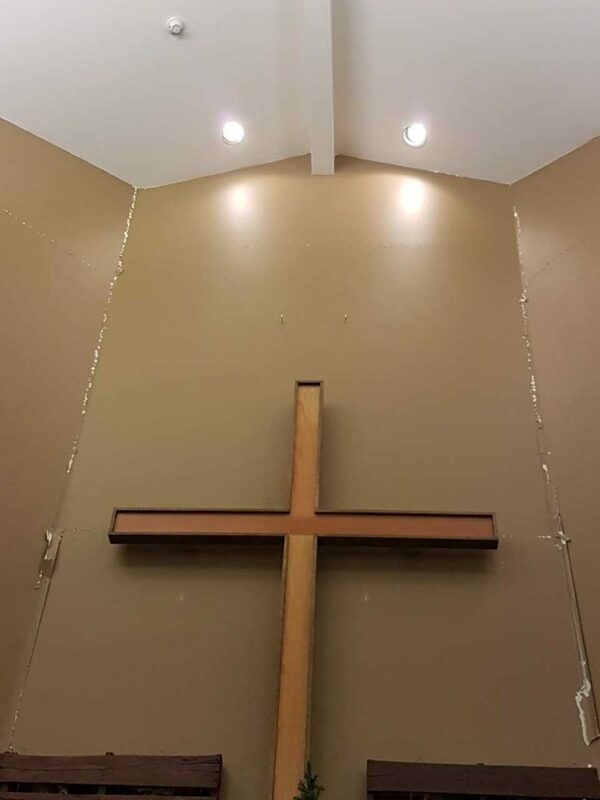 The church sustained an estimated $50,000 in damage, mostly due to cracks in drywall and bricks that fell from one side of the church. Engineers determined on Saturday that the building was safe so it has become home to a doctor’s office, a counselor, and an organization that assists children with special needs and behavioral issues. It didn’t take long for the groups to begin using the space. The medical office was able to begin moving in equipment on Monday and began receiving patients on Wednesday. The church also has opened its gym so that teenagers can play basketball and has offered its space to the Federal Emergency Management Agency so they can interview people seeking assistance. Less than a week after the original earthquake, a doctor’s office was able to open at Community Covenant Church. Michero said it was it was heartening to see people whose homes were heavily damaged come to the church soon after the initial quake to help clean up and provide whatever assistance was needed for community members. “People are on edge” still when the stronger aftershocks hit, Michero said. None of the members of Chugach Covenant Church in Anchorage sustained heavy damage to their homes, and people are starting to adjust to the aftershocks, although the stronger ones cause children and some adults to become fearful. The aftershocks have caused cracks in buildings and roads to widen, he added. The church meets in a school that the district closed after the quake and which will remain closed at least through this weekend. The congregation had to cancel services, and members met at either First Covenant in Anchorage or Community Covenant. They will join First Covenant in Anchorage, which is closer, this Sunday. Schoffman said he didn’t know when the school might reopen. The church, which was planted by First Covenant, also meets in a school so was unable to hold services last week. Although they won’t be allowed in the building this Sunday, they plan to have a brief candlelight service this week. Drywall cracked at Community Covenant Church. In January, Wasilla was shaken by a 7.9 earthquake that had its epicenter more than 300 miles away, southeast of Kodiak Island. Since 1899, the area has experienced more than eighty earthquakes of 6.0 or greater. In 1964 a 9.2 magnitude quake struck nearby Anchorage and caused a tsunami, together killing 125 people. “We learned a lot through this experience,” Millikin said. An important less was that their building is structurally sound and could become an emergency response center. 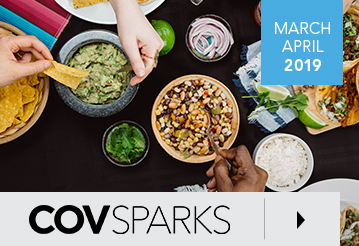 In recent years, Community Covenant also has focused on disaster preparedness, which has included bringing emergency survival kits to neighborhood homes. They also have hosted disaster-preparedness events for the area that included state and local officials sharing about resources. In addition to preparedness resources, the event featured interactive displays, an Anchorage Fire Department firetruck, a LifeMed Alaska medical evacuation helicopter, and an earthquake simulator from the State of Alaska Division of Homeland Security and Emergency Management Agency. About 100 people attended a previous event. “Maybe it will be better attended this year,” Michero quipped. One thing is certain: They won’t need to bring the earthquake simulator.